Problems on your Vizio E701i-A3 LED TV screen? Those scrambled pixels, faded colour and black screen on your Vizio E701i-A3 LED TV may be caused by a faulty T-Con board. The problem is a 8 pin eprom chip failure on the lower right side of the RUNTK5261TPZH timing control board (T-Con) that interrupts the video signal to the Main board. This T-Con board failure is happening at 500 hours of usage and according to VIZIO affects those E701i-A3 TVs with serial numbers from LFTRNXAN4500001 to LFTRNXAN4702936. If your VIZIO E701i-A3 is older than a year, your warranty will not cover the replacement costs for a new T-Con board. Fortunately the replacement RUNTK5261TPZH T-Con board is available for sale online for under $150. 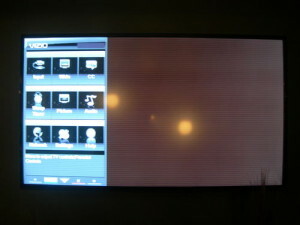 Turn the VIZIO E701i-A3 television off. Unplug the power cord. Lay the VIZIO E701i-A3 TV on a flat, padded surface. Remove the TV stand by loosening the screws at the base. Both the stand and post must be removed in order to remove the back panel. Go to the back of the panel. Remove all the screws holding the back panel in place. Put the screws to one side. Remove the back panel from the E701iA3. The RUNTK5261TPZH T-Con board is located in the middle top of the back panel, usually under an aluminum cover held in place by four corner screws. It may also be held in place with foil tape at the top. It’s connected to the Main board through a black LVDS cable and flat ribbon cables. Loosen the screws holding the RUNTK5261TPZH T-Con board in place. Place it to one side. This board is considered e-waste and should be sent to a recycling facility. Do not place into regular garbage. NOTE: Be sure to put on your rubber gloves before touching the new T-Con board. Hold the RUNTK5261TPZH T-Con board by the edge and avoid touching any of the components since they are very sensitive to electrostatic charges. Re-connect the LVDS cable by putting the connector end into the RUNTK5261TPZH T-Con board until it clicks into place. Replace the RUNTK5261TPZH T-Con cover. Tighten the screws. Place the back cover back onto the VIZIO E701i-A3 TV and tighten all the screws. Re-install the stand and post. Remount the VIZIO E701i-A3 TV. I have a Vizio 70 model E7101I-A3 an LFTRNXBP 3301310. I have a black screen with sound and backing light working I feel this T-con board is what I need. Which board should I use to fix my problem or are they all the same. Thanks. How old is the projector lamp in the TV? If it’s reaching end of life that would give you a black screen with some back light. Check the time left on the lamp as it may be time to replace it. If it was the T-Con board you would have no sound at all. The T-con boards are not the same as each model has its own specifications. You could try contacting the Discount Merchant customer service line for more information about which T-con board you would need. 1-800-281-8860 or try joining our forum where there is a community of experts that can offer you more advice and guidance. I hope this helps. I have a vizio tv model E701i-A3 I bought the tv like 4 years ago just one night the screen turning black no sound no image and the little light they have in the bottom of the tv doesn’t turn on two so I don’t know what is the problem with my tv maybe the main board or T-con I don’t know the board for the power supply I know is working because if I connect the tv I have a light in the back. Someone can help me please. This sounds like a bad T-con board. IMPORTANT: If your TV has No Picture/No Video, this is likely caused by a bad T-con board, and NOT a bad main board. I would check with the http://www.shopjimmy.com/vizio/e701i-a3 for this part but you may need to contact a technician since this is a major repair. So sorry for your hassle. The fires thing to check is to see if the TV is still under warranty. If so then get your technician to check the T-con boards, the back light and the LED screen itself. These are all the components that could possibly be causing these issues. You will definitely need a technician to do these repairs. Parts can be found at http://www.shopjimmy.com/ Hope this helps. I have a Vizio E701I-A3E TV. I have no picture, but I do have sound. I replaced the T-con Board and everything was working normally. After a few hours of operation the picture went out again. Is this a bad replacement board or is there another issue that caused the new T-con Board to fail and lose picture? There is a possibility that the projector lamp got knocked and the connections became loose while replacing the T-Con board. I would trying re-installing the lamp light and see if that helps. The other possibility if that the ballast wheel has become unstable and not firing properly. Start off the with lamp and go from there. If you go to our forum you will find more advice from experts. Please stay in touch and let me know how things are going. I can reach out to our forum experts to provide more answers. I have a E7001iA3 model and my TV has sound but no picture. I bought it in 2013 at Walmart on Black Friday. Can someone please help me to maybe fix this thing. I did here n there used to hear a small popping noise and it shuts off my TV before it just went all the way Black. I thought it was my electricity in my walls. My power still surges from time to time though. It’s your TV projector lamp that has died and needs replacing. Follow our guide to show you how to replace the lamp. The small popping sound you heard what probably the lamp exploding from being end if life. All the symptoms point to the projector lamp. Be sure to buy an OEM original lamp since they last longer and are calibrated to work with your TV.